The pattern is full of colored monsters. Complete the task and match monsters with each other to build a line of three or more similar monsters. Blow them, get coins for it and try out the next level. 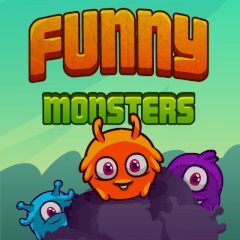 Funny Monsters is a game about cute, varicolored creatures that are waiting for you to come. They smile looking at you, but you should move them to build the line of three similar monsters. It will disappear and give you coins. Complete tasks and purchase tokens, that you can use in the game. Match the criteria and proceed to the next level.